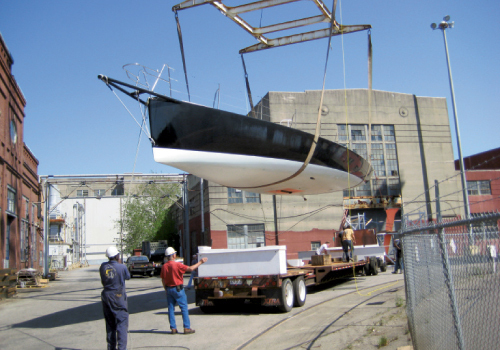 In a North Charleston warehouse, the boat is stripped, sanded, and painted. 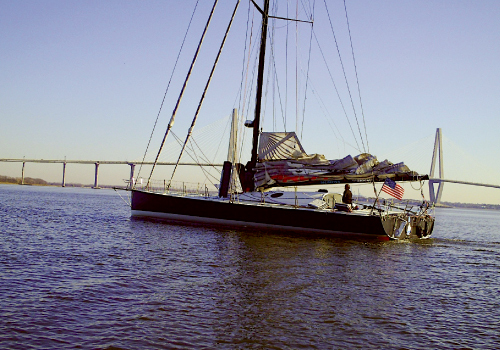 The crew will also outfit the vessel with new hardware, electronics, wiring, and sails. Photograph by Kaitlyn Iserman. 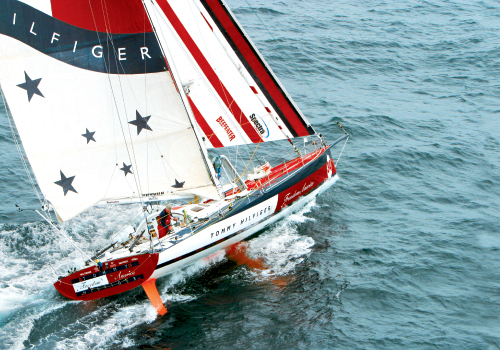 In December 2002, Brad Van Liew departs Cape Town, South Africa, and heads into the Southern Ocean on the third leg of his winning Around Alone voyage aboard Tommy Hilfiger Freedom America. Light weather, known as the doldrums, is frustratingly slow for the racer, because every mile counts. To repair the gennaker halyard, a line that hoists the sails, Brad climbs solo to the top of his mast. 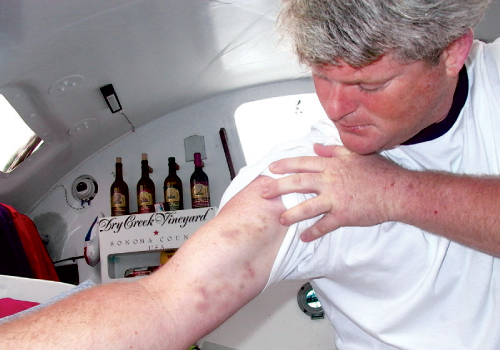 His bruised arms document the rough nature of such an endeavor. 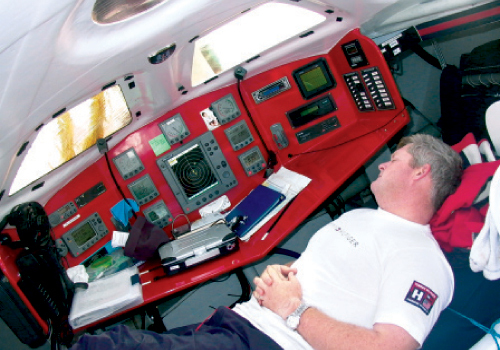 At the nav station, he sleeps in catnaps that average 26 minutes. 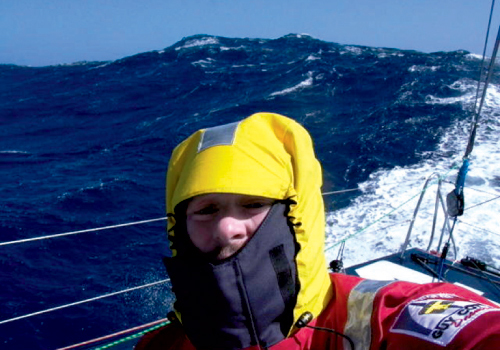 Brad braves rough seas in full offshore weather gear, including harnesses to strap himself to the boat. 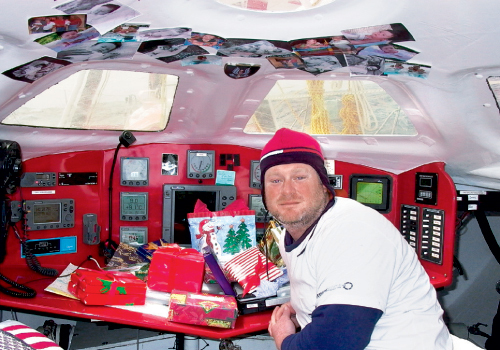 From the Southern Ocean, he wishes eight-month-old Tate Merry Christmas for the first time via satellite phone. On Christmas Day, with only photos to keep him company, Brad opened a small pile of gifts, including books, DVDs, and a pint-sized African tree. 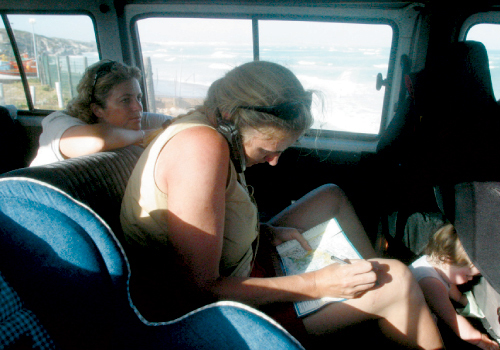 Meaghan works out of a VW van on sponsorship and media coverage. Photographs by Billy Black. 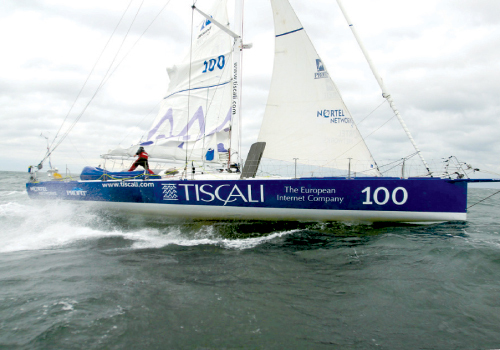 The late Simone Bianchetti sailed Le Pengouin in the 2002-03 race under the sponsor name Tiscali. Photographs by Billy Black. A press conference upon Brad’s arrival in Charleston. Photographs by Billy Black. Meaghan and baby Tate greet Brad upon his arrival in Cape Town following a storm-ridden journey from England; this is only the second time he’s seen her in more than two months. Photographs by Billy Black. 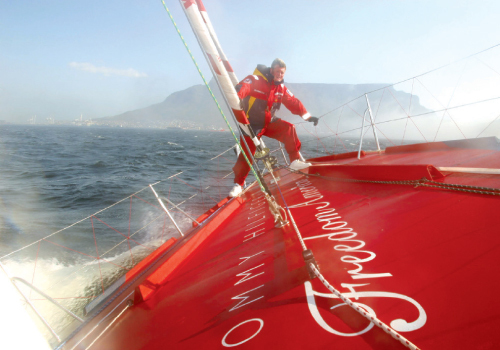 Brad sails off the coast of South Africa just beyond Cape Town’s prominent Table Mountain. Photographs by Billy Black. 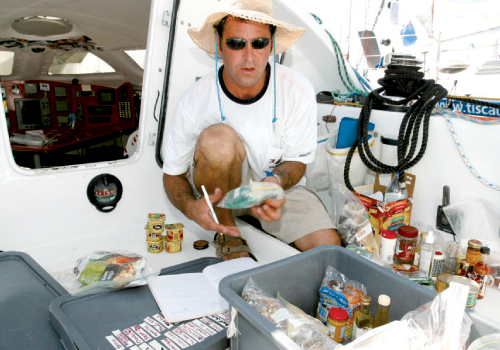 Kurt Oberle of High & Dry Boat Works organizes provisions. Photographs by Billy Black. 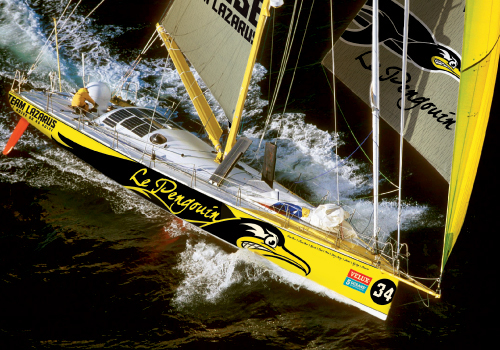 vanliewpg21.jpgAlthough the boat has raced under several sponsor names (see page 57), it is officially registered as Le Pengouin. “Since I’m going back to my solo sailing roots, I thought I’d go back to the roots of the boat as well,” says Brad. Original photograph by Jacques Vapillon. 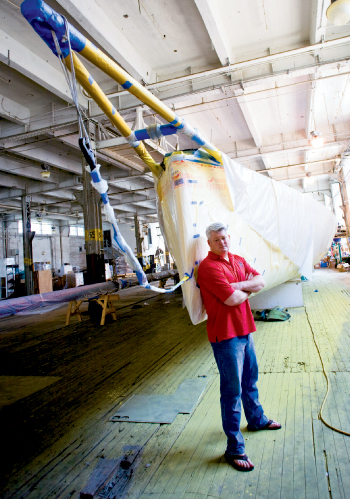 Marine Corps: For two months this winter, Brad and his crew took turns sailing the Open 60 yacht across the Atlantic to Detyens Shipyards. Photograph by Pepe Hernandez. 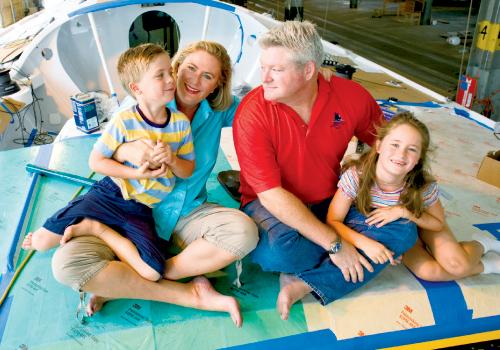 His wife, Meaghan, who is serving as public relations and marketing director of Brad’s racing campaign, and the couple’s two children, Tate, age eight, and Wyatt, five, will be flying to and living in each race port—La Rochelle; Cape Town, South Africa; Wellington, New Zealand; and Salvador, Brazil—before the race’s penultimate leg into Charleston, which is expected to bring boats into the harbor beginning around April 25, 2011. For up to two months in each city, the Van Liews will rent a house “where we can have all traveling members of the team in one place,” says Meaghan. “It should make for a real circus at times!” The group includes Brad, when he’s in port; Meaghan; her brother, Brendan Fitzgerald; shore crew Jeffrey Wargo and JC Caso; two or three volunteers from Charleston; and, of course, the kids. The couple has also hired a teacher to homeschool the children, who will have the opportunity to explore the individual cultures of each country and delve into the Van Liew family heritage. On an oversize world map that sits propped against the dining room wall of the family’s Darrell Creek home, Wyatt has drawn his dad’s route. He and his sister like to trace their fingers along the path they will follow along with their father. And they make plans for adventures in each port. Tate is intent on surmounting the Eiffel Tower in France, while Wyatt has his sights set on climbing a volcano in New Zealand. The elder sibling readily pipes up that she’s looking forward to speaking French, which she’s studied at Ashley Hall since kindergarten. “Tate knows more French than anyone in the family, so she may be our greatest resource at restaurants and stores,” notes Meaghan. Now veterans of two around-the-world solo races, this couple knows all about valuable life experiences. In 1992, Brad Van Liew of San Diego and Meaghan Fitzgerald of Chicago, both students at the University of Southern California, met after evacuating from L.A. during the Rodney King riots. Brad was considering a career in military or commercial flying; Meaghan was making her way into corporate public relations. “I thought, ‘Wow, a pilot. I could travel the world with him,’” she says with a laugh. A non-sailor, Meaghan knew only a little of the history of around-alone racing, but Brad was passionate about the sport. He’d helped sailor Mike Plant get his boat ready for the 1989 Vendée Globe solo race, then tried to enter the 1990 BOC Challenge himself but couldn’t raise enough money to make it to the start. And though his friend and mentor was lost at sea the same year Brad met Meaghan, he still harbored a dream of racing the globe single-handed. The pair married in 1996 and together reached the decision that Brad would enter the 1998-99 Around Alone. This time, with Meaghan’s communications skills filling his sails and his sponsorship slots, the campaign succeeded. And the couple fell in love with Charleston, which served as the start/finish port for the event. A sailor since childhood, Brad had previously participated in Grand Prix yacht racing in Newport, Rhode Island, but he was the new kid on deck during that first circumnavigation, finishing third in his class after dismasting off the coast of Uruguay. Then in the 2002-03 race, Brad won his class aboard Tommy Hilfiger Freedom America. After settling in Mount Pleasant, Brad and Meaghan were hired to head the S.C. Maritime Foundation and tasked with getting the Spirit of South Carolina built and launched. The codirectors also raised millions of dollars in capital, managed foundation events such as Charleston Harbor Fest and Charleston Race Week, and established onboard student experiences to meet state standards. “There’s no question that we couldn’t have achieved what we have with the Spirit without each other,” says Brad. “We make a good team because we’re so different. Meaghan’s very much a numbers person, and she looks at things with a different filter than I do. I’m the eternal optimist; she’s the devil’s advocate. So we play off each other a lot.” But by 2009, with the tall ship’s sails unfurled, educational programs under way, and the foundation in working order, the Van Liews were looking for a new challenge. 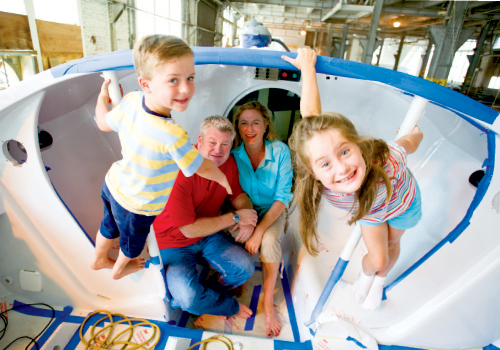 Last year, they left the foundation and launched “Project Lazarus,” the family’s inside name for Brad’s campaign to come “back from the dead” and return to globetrotting on the world’s oceans. “I drove a desk for way too long,” he says, noting that since he stepped back into the sport, he’s feeling younger every day. A bear of a man with a shock of sandy gray hair; a big grin; and a hearty mix of competence, competitive grit, and boyish exuberance, Brad is now deliberately 20 to 30 pounds overweight—on the first leg of the race, he’ll lose half a pound a day. The Velux 5 Oceans will likely have eight to 10 entries in the new Eco 60 class. “Eco stands for economical and ecological,” he explains. The boats, older Open 60s, have been recycled. Class rules limit the number of shore crew and sails and call for alternative sources of power—solar, wind, and hydro. “Brad is attempting something no one has accomplished in the modern era of ocean racing: sailing solo around the world using no fossil fuels whatsoever,” says Meaghan. He intends to use at least eight solar panels and two prototype hydro generators (whirlies off the back of the boat). That said, safety is uppermost in Team Lazarus’ race plan. Brad says he follows a mantra that Isabelle Autissier coined, ironic seeing as “she’s blown up more boats than anyone else,” he jokes. “There are three objectives: First, get yourself home in one piece. When it comes to your safety, using your brain, and preparation in particular, you have to have the skill set and the tools to come home. Second, bring the boat with you. I always think, ‘If the boat were a living, breathing thing, am I asking her to do more than she can handle?’ Third, win.” He knows, though, that sometimes you have to sacrifice number three—especially when there’s more than just one man riding on this adventure. All of the boats in this year’s race will carry 21st-century media technology including digital cameras, fixed and roaming video cameras, wireless microphones, camera control units belowdecks, HDV recorders, and dedicated media laptops (a far cry from the handwritten notes that Sir Robin Knox-Johnston launched to passing ships with a slingshot in 1968). “The boats will be more connected to the world than ever,” says Meaghan. On its website (www.oceanracing.org), Team Lazarus will also offer an Education Station page just for children. Kids can see what the littlest Van Liews are up to through photos and eight-year-old Tate’s “roaming reporter” blog. 1994-1995: The BOC Challenge starts and finishes in Charleston. Winners: Christophe Auguin, Class I; David Adams, Class II. 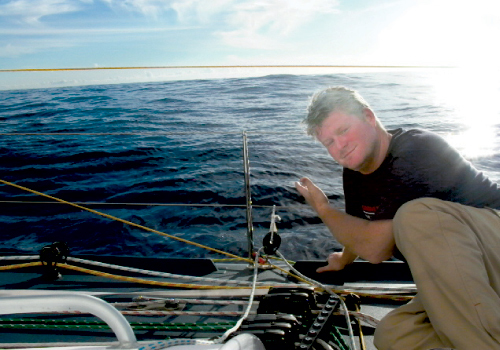 Josh Hall’s boat sinks on Leg 1 to Cape Town; he is rescued by racer Alan Nebauer. Isabelle Autissier’s boat sinks off Australia; she is rescued by an Australian Navy ship. 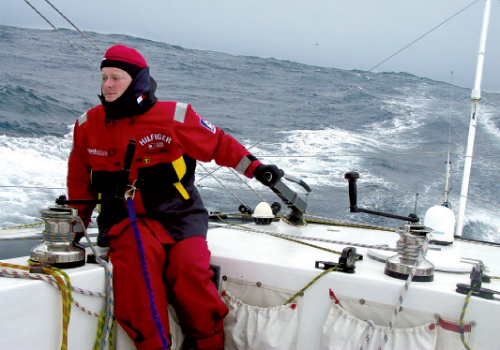 Harry Mitchell is lost at sea in the Southern Ocean. 1998-1999: The race, renamed Around Alone, starts and finishes in Charleston. Winners: Giovanni Soldini, Class I; Jean Pierre Mouligne, Class II. Brad Van Liew places third in Class II on Balance Bar after being dismasted off Uruguay, making repairs, and restarting the leg. 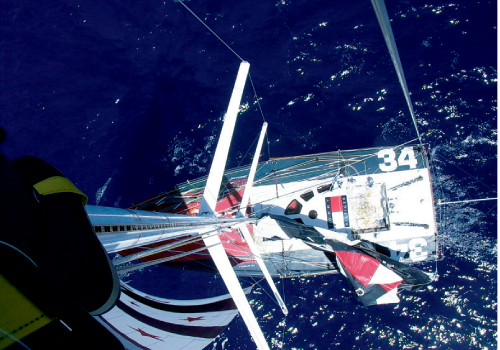 Isabelle Autissier’s boat capsizes in the Southern Ocean; she is rescued by racer Giovanni Soldini. 2002-2003: Around Alone starts in New York at Ground Zero and finishes in Newport, Rhode Island. 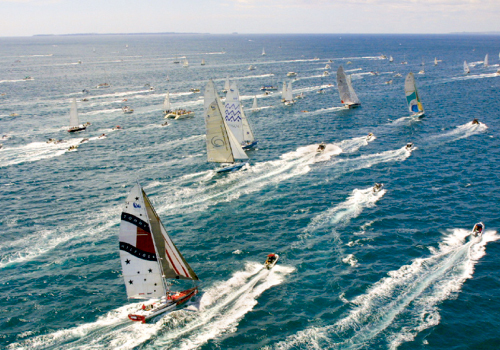 Winners: Bernard Stamm, Class I; Brad Van Liew, Class II, aboard Tommy Hilfiger Freedom America, by a margin of 21 days. 2006-2007: The race, renamed Velux 5 Oceans, starts and finishes in Bilbao, Spain. Winner: Bernard Stamm, Class I. Sir Robin Knox-Johnston, chairman of race organizer Clipper Ventures, finishes fourth at age 67. 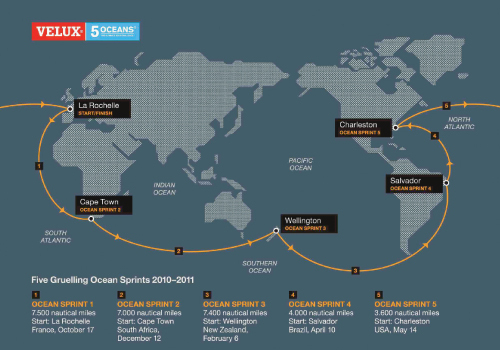 2010-2011: The Velux 5 Oceans begins October 17 in La Rochelle, France, and will finish there next spring. 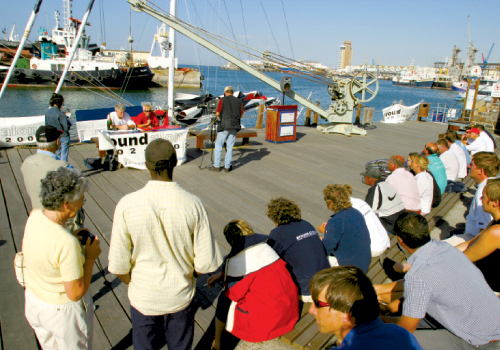 The event marks the premiere of the Eco 60 class, which encourages the environmentally friendly redesign of Open 60 yachts launched before 2003. Last summer was Charleston’s hottest on record—at least since 1938, when temperatures were first regularly monitored.